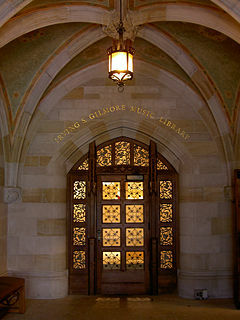 Entrance to the Gilmore Music Library inside Sterling Memorial Library at Yale University. Picture by Henry Trotter, 2005. A music library contains music-related materials for patron use. Use of such materials may be limited to specific patron groups, especially in private academic institutions. Music library print collections include dictionaries and encyclopedias, indexes and directories, printed music, music serials, bibliographies, and other music literature. Collections may also include non-print materials, such as digitized music scores or audio recordings. For example, the University of Virginia Library provides access to an online music collection. Others such as the International Music Score Library Project, Project Gutenberg:The Sheet Music Project focus on public domain music sheet collections and give free access to all via the Internet. Music librarianship is the specialized area of librarianship that pertains to music collections and their development, cataloging, preservation and maintenance, as well as reference issues connected with musical works and music literature. Music librarians usually have degrees in both music and librarianship (typically, a Master of Library and Information Science and at least a college-level music degree). Music librarians deal with standard librarianship duties such as cataloging and reference, but the addition of music scores and recordings to collections complicates these tasks. Therefore, music librarians generally read music and have at least a basic understanding of both music theory and music history to aid in their duties. There are also professional associations for music library and librarians such as the Music Library Association Inc.(U.S.). The MLS provides support, resources, and professional training as well as platforms to discuss issues about music libraries. Music libraries also have other forms or components. Digital music libraries and archives preserve recordings and digitized scores or literature in a variety of electronic formats. Many music libraries dedicate part of their duties to digitizing parts of their collection and maintaining digital files. Digital preservation requires specific procedures to avoid decay, obsolescence, and loss. Digital materials may be part of a larger, physical collection, or may compose an entirely electronic collection not physically accessible (usually housed on a network or on the Internet). Access may be limited as a fee-based service, a private service to specific user groups (such as students at a conservatory), or freely accessible to the public. For example, Music Library at University of Virginia Library holds online digital music collections and the access is limited to their students. There are also music library projects which use online environment alone without physical library. For example, International Music Score Library Project, Project Gutenberg: The Sheet Music Project hold public domain music sheet collections and they give free access to all users on the Internet. Eastman School of Music, Rochester, New York, USA - Sibley Music Library (Miller Center) exterior. Most early written Western music was predominantly non-secular. Collections of written music and literature were held by monasteries, cathedrals, and other religious establishments, such as church music societies, offices, and seminaries. As universities emerged in the twelfth century, libraries formed throughout Europe, and obtained donations or gifts from monasteries and private collectors. The advent of national and centralized libraries two centuries later allowed for greater attention to special materials like music collections. Up to the end of the fifteenth century, music collections had been limited to religious organizations, private collectors, or small areas of university libraries. Public collections grew with the development of printing at the end of the fifteenth century and the surge of scholarly and artistic endeavors of the Renaissance. Music librarianship since the Renaissance has grown alongside modern librarianship, but with more unique, dedicated facilities for materials. In the eighteenth and nineteenth centuries, the establishment of conservatories created a need for music collections that supported learning at those institutions. While the proliferation of classification schemes has given music a niche in modern public and academic collections, other institutions maintaining music-only collections have contributed to the rise of music libraries. These include conservatories, music information centers, composers' and performing rights associations, opera houses, music publishers, and media facilities involved with broadcasting and film. In the United States, most librarianship degrees begin at the graduate level. At the undergraduate level, potential music librarians study music at any number of schools and programs (theory, history, performance, production, business and education). Following the coupling of an MLS and undergraduate music degree, many music librarians also elect to study music at the graduate level. Additionally, doctorate programs are available in both music and library science. In Masters level degrees of library science, typical music-oriented offerings examine the different materials of music collections, such as music-specific dictionaries, encyclopedias, bibliographies, indexes, and other music literature. Music librarianship offerings may also address music reference, cataloging issues, collection development and maintenance, binding and repair, preservation, evaluation methods of antiquarian material appraisal, and music librarianship education (teaching methods). Certain music librarianship areas of practice do not require a library degree- performance library management, for example. Librarians usually receive on-the-job training to become familiar with the inner workings of their collections. This may include training in a particular classification scheme (such as Library of Congress Classification or ANSCR), binding procedures, or protocols regarding patron usage of materials. Additionally, many librarians elect to participate in continuing education classes and programs available through professional organizations and other outlets. For example, music librarians preparing for a large scale cataloging project might take a cataloging workshop focusing on a particular scheme or music cataloging issue. Librarians training for a position that involves a new technology might apply to classes offered by external companies in specific software or hardware. The ultimate goal of music library education is to engender core competencies in students preparing to enter the field.. The Music Library Association maintains a list of library and information science schools that teach music librarianship or accept music credits as part of their library degree programs. Music librarians work with collections in a variety of settings. Music libraries take several forms, and often are maintained as a part of a larger collection or institution. The nature of a music library facility depends heavily on the role of the music library within its parent institution. 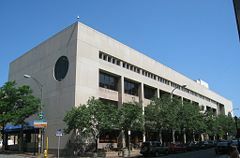 At academic institutions dedicated to music (such as a music conservatory), the music library may be the main library collection of the school. In colleges or universities where music is only one aspect of academic focus, the music collection may be integrated into the greater library system, or a separate collection from the main library. Performance music libraries serve a unique function and are often housed with performance spaces. Entirely digital music collections require server space and proper housing of digitization equipment, although many music libraries in the process of digitization have facilities for such services. Other factors influencing facilities include the types of materials in the collection, the users who will access those materials, and budget constraints related to implementation, acquisition, maintenance, and service. Most music librarians have an array of tasks to perform, depending on the nature of their collection and position. General duties include cataloging and reference, acquisition and collection development. It is common to specialize in one or more areas of music librarianship, particularly for work in special collections. Music materials require different cataloging methods than other fields. While music literature can be classified and cataloged according to general cataloging rules, music scores and sound recordings present unique challenges. Examples include uniform titles, responsibility (composer versus performer), and how to classify sound recordings (by genre, composer, etc.). The Music Library Association is a professional organization for music libraries and librarians including those whose music materials form only part of their responsibilities and collections. The Music Library Association, Inc. (U.S.) is one of the main music library associations and it serves corporations, institutions, students, composers, scholars and others whose work and interests lie in the music librarianship field. National meetings occur annually. The purposes of the Association shall be to promote the establishment, growth, and use of music libraries; to encourage the collection of music and musical literature in libraries; to further studies in musical bibliography; to increase efficiency in music library service and administration; and to promote the profession of music librarianship. The Association is a non-stock, non-profit corporation organized and operated exclusively for said purposes. No part of the net earnings of the Association shall inure to the benefit of any individual. No officer, member, or delegate of a member shall, as such, receive compensation except that reasonable compensation may be paid for services of employees of the Association. Administration: officers of the MLA, including the board of directors, special officers, editors, and business office. Committees: groups formed to address specific issues in the (standing) categories of development, education, finance, membership, program and publications. Special committees are appointed by the president for administration, awards, bibliographic control, legislation, preservation, public libraries, reference and public service, and resource sharing and collection development. There are also joint committees involved with other institutions, such music organizations and academic institutions. Representatives and Liaisons: to external organizations involved in library and information science and/or music. Roundtables and Interest Groups: comprised of MLA members, assembling during annual meetings. Roundtables allow members to discuss specific issues not covered by committees. Regional Chapters: As stated on the MLA website, these chapters have two functions: "To promote cooperation among music librarians and among libraries within a given region" and "To provide a forum for discussion of library matters, some of which may be more specific or more regional in nature than those on programs at national meetings." Like the MLA, regional chapters have listservs that they use to distribute information to members. The MLA offers membership on a yearly basis. Costs vary depending on the type of membership (institutional, associate, student, retired, etc.). Basic Manual Series- "designed to assist the librarian in dealing with various aspects of the organization, administration and use of a music library." Index and Bibliography Series- presenting resources for music and music literature, from discographies of popular music to bibliographies of subjects in ethnomusicology. Technical Reports- viewing the hands-on aspects of the field, such as cataloging issues, audio equipment, and current research topics. The MLA website offers a wide range of services and resources to members and non-members alike: employment and education information, awards and grants, copyright guidelines, and resources concerning the field. These include the MLA-L (a listserv open to the public), resources generated by the MLA committees and groups, external resources via print and web, and the MLA Shop, which is the organization's official store. ↑ Music Library, University of Virginia Library. Retrieved December 19, 2008. ↑ Rita Benton. Libraries §2 Early History. Grove Music. ↑ Rita Benton, Libraries §3 Types. Grove Music. ↑ MLA. "Music Librarianship- Is it for you?" Music Library Association- MLA Employment and Education. Retrieved December 19, 2008. ↑ “Core Competencies and Music Librarians” Music Library Association, 2002. Retrieved December 19, 2008. ↑ "List of Library Schools with Music Offerings"musiclibraryassoc.org. Note: this list is current to July, 2004. Retrieved December 19, 2008. ↑ Malcolm Jones. Music Librarianship. (London: Clive Bingley, 1979), 15-16. ↑ Brian Redfern. Organizing Music in Libraries. Vol. 2: Cataloging. (London: Clive Bingley, Ltd., 1979), 17. ↑ Richard Smiraglia. Bibliographic Control of Music, 1897-2000. (MLA Index and Bibliography Series No. 32.) (Lanham, MD: Scarecrow Press, 2006), 6-8. ↑ Bylaws of the MLA. Retrieved December 19, 2008. ↑ MLA- Regional Chapters. Retrieved December 19, 2008. "SOLUTIONS - Solutions: Home - Stream Your Music Library Wirelessly." PC Magazine : the Independent Guide to IBM-Standard Personal Computing. 26 (3)(2007): 88. Bradley, Carol June. American Music Librarianship: A Research and Information Guide. New York: Greenwood Press, (1990) 2005. ISBN 0415972914. Articles and extensive bibliography. Documentation Centres Inte Archives, and Richard Turbet. Music Librarianship in the UK: Fifty Years of the British Branch of the International Association of Music Libraries. Ashgate Publishing, 2003. ISBN 0754605728. Morisset Library. Music Library. Université d'Ottawa, Bibliothèque Morisset = University of Ottawa, Morisset library, 1975. Music Library Association. Music Library Association. Canton, MA: The Association, 1998. Redfern, Brian. Organizing Music in Libraries. Vol. 2: Cataloging. London: Clive Bingley, Ltd., 1979. All links are retrieved November 1, 2018. Florida State University Music Library - Contains useful links to electronic resources. Music Library, University of Virginia Library. This page was last modified on 1 November 2018, at 16:27.